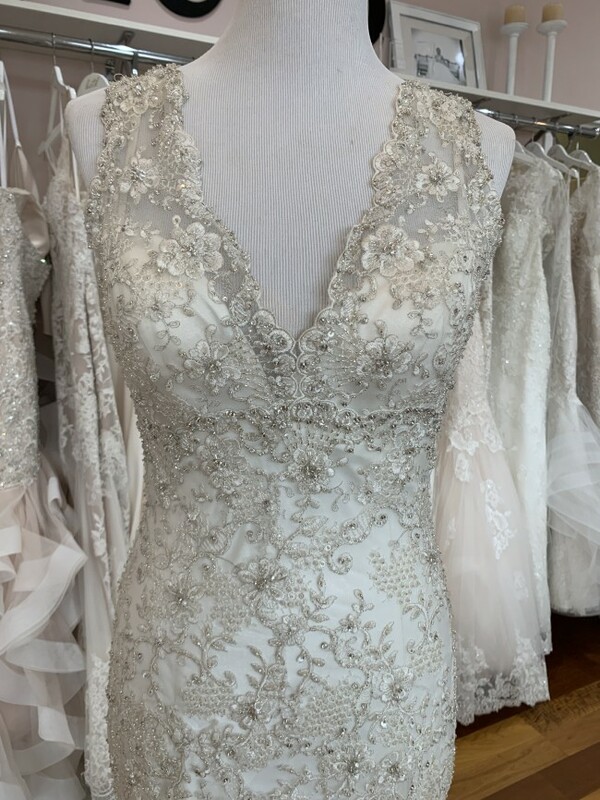 This dreamy lace gown features a subtle train and deep V back, as well as delicate beading throughout the gown. Dress is in good condition, no stains or tears, just wear from being tried on. We offer a very EASY return process. Please let us know within 72 hours of receiving the dress, if you would like to return the dress. You can ship it back to us at your cost or we will email you a return UPS label. The dress must be in the same condition as when it was shipped to you. If the dress is returned, the refund will be processed within 48 hours of the dress being delivered back to Here Comes The Dress. Returns will be subject to a 10% restocking fee. However, exchanges are available for another style we have for sale, and the restock fee will be waived for exchanges. Once you send a message, Aubrey can invite you to purchase the dress.